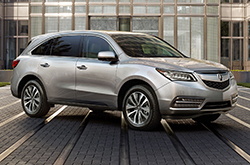 With the 2016 MDX, Acura reminds us once again that luxury does not have to come at the cost of sport. The upscale crossover SUV employs a combination of power, safety and style to ensure drivers the finest ride possible, no matter where the road may take them. Whether you are looking for a vehicle with enough room for the whole family, an efficient SUV that is fit for your next adventure or a smooth ride to drive around town, you will find exactly what you need in the 2016 Acura MDX in Peoria. With the new 3.5-L V6 engine, MDX drivers can take control using push button gear selection, a feature of the all-new 9-speed automatic transmission. This sleek transmission and performance technology makes for a smooth, quiet and enjoyable ride, regardless of destination. Beyond boasting about the SUV's stellar drivability, 2016 Acura MDX reviews all note the innovative safety features that have made this vehicle a standout in its class. Between a suite of optional safety technologies under AcuraWatch Plus, the MDX offers peace of mind and extra assurance to drivers. In addition to its safety value, the MDX is also extremely secure. The improved AcuraLink® security system pairs the most innovative security technologies with smartphone applications to disengage the ignition and notify owners in the case of break-ins or theft. Car ownership has never been easier and more secure than it is now with the 2016 Acura MDX. After all, 2016 Acura MDX reviews make sure to mention that the additional features are exactly what drivers hope for in a luxury crossover. Smart and cutting-edge, these features include the classic Acura automatic LED headlights, a power liftgate, temperature controlled eight-way power front seats, hands-free Bluetooth connectivity, keyless entry, a sunroof, folding second and third rows, and optional GPS systems. Test drive a 2016 Acura MDX in Peoria today and discover its place at the intersection of classic luxury and contemporary function. 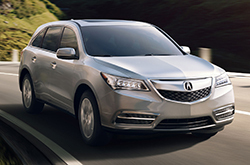 With its impeccable charm, unparalleled performance abilities and its extensive list of features, it is no wonder that Edmunds.com claimed that "the 2016 Acura MDX is a top pick among three-row luxury crossovers." The 2016 BMW X5, Ford Flex, Buick Enclave and the Volvo XC90 are outdone by the 2016 MDX in quite a few areas. 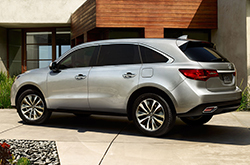 Just a few of the characteristics that shoppers in AZ will love are the MDX's tasteful exterior styling and low cost. It's a fabulous value, which you'll definitely see when comparing its price to the aforementioned vehicles. Find out more - See the bullets below this paragraph! Welcome to the Acura of Peoria review of the new MDX. After reading our overview above, if you decide the MDX isn't the right vehicle for your commuting needs, please check out other 2016 Acura reviews in our research gallery. Not all West Phoenix Area car retailers are alike. We differ from others in that we feel it's our obligation to provide customers with quality reviews. As you read this article, you'll see that it is bundled with reliable information about all the things you're looking for in the new MDX - powertrain options and other specs included. 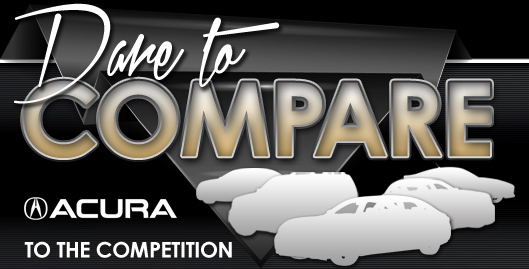 Learn more about our finely crafted lineup of vehicles; visit the research directory to review and compare other models on sale at Acura of Peoria now! **Government 5-Star Safety Ratings are part of the U.S. Department of Transportation's New Car Assessment Program (www.safercar.gov). Model tested with standard side airbags (SAB).